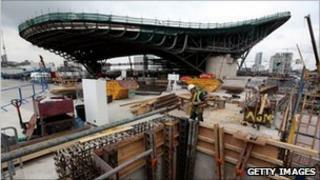 The UK economy grew by more than initially thought in the second quarter of 2010, boosted by a strong performance by the construction sector. The economy grew by 1.2% in the quarter, the Office for National Statistics (ONS) said, revising up its initial estimate of 1.1% growth. That was the fastest rate of quarterly expansion recorded since the first three months of 2001. But most economists do not expect this level of growth to continue. The first estimate of gross domestic product (GDP) is usually revised twice at monthly intervals. Meanwhile, the US Commerce Department revised down its growth estimate for the second quarter. It now says the US economy grew at an annual rate of 1.6%, down from its first estimate of 2.4%. Federal Reserve chairman Ben Bernanke has responded, laying out four "unconventional" policy options to boost the US economy. Top of the list is more "quantitative easing" - mass purchases of debt. The ONS said construction output grew by 8.5% in the second quarter, up from a previous estimate of 6.6%. Aileen Simkins from the ONS said the overall effect in the quarter had been "very positive". But one area that suffered a big fall was air transport, which fell 11%. Ms Simkins said the fall in air transport reflected the effect in April of the ash cloud as well as the British Airways strike. A spokesman for the Treasury said: "While the government is cautiously optimistic about the path for the economy, the job is not yet done. "The priority remains to implement the Budget policies which support economic rebalancing and help ensure the sustained growth that the Office for Budget Responsibility forecast this year and next." Growth in the key services sector, which accounts for about three-quarters of the UK economy, was revised down to 0.7%. Within the sector, business services and finance posted a rise of 1.5%, revised up from 1.3%. But business leaders warned that the strong pace of growth would not last. "Today's figures are obviously good news, but we shouldn't get carried away," said Graeme Leach, chief economist at the Institute of Directors. "Instead of looking in the rear view mirror at what has passed, it would be wiser for us to keep our eyes on the road ahead. We don't expect this level of growth to be sustained through the second half of 2010. "But whether or not this slide will turn into a quarterly decline or a double-dip recession remains highly uncertain." Meanwhile, David Frost, director general of the British Chambers of Commerce, said that economic growth in the US was of equal concern. "Clearly the US is a major driver for the global economy. We know that China is performing well, but the US has a fundamental role in driving the economy and any weakness in that will ripple through," he told the BBC. "So we've got to ensure equally that growth in the US will get back on track." And David Blanchflower, a former member of the Bank of England's rate-setting Monetary Policy Committee, told the BBC that the UK could not get onto a stable economic footing until the it scrapped the austerity budget. The coalition will announce details of its spending review later this year, but the approach was "exactly the wrong thing" Mr Blanchflower said. "We've started to see consumer spending slow. We've started to see the economy slowing with the idea that these spending cuts will hit. "Spending has to be dependant upon the data and the data has started to slow and in my judgement it would be very mistaken to proceed ahead as the chancellor is doing." The second-quarter performance in the UK marked a sharp pick-up from the 0.3% growth seen in the first three months of the year. Shadow education secretary Ed Balls said that the previous Labour government could take credit for the most recent expansion. "Those figures are for the period for April, May and June, which are absolutely determined by what was being done in the previous year," he said. "The question is whether that pattern, which you see confirmed today, which I think is a vindication of what we were doing in government, whether that pattern continues or whether it goes into reverse."